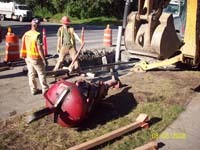 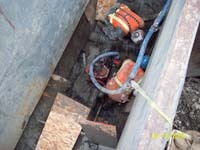 As a subcontractor to Alaska Road Boring we were responsible for all waterline excavation, drilling support for waterline bursting, including insertion and receiving pits, construction of mainline, fire hydrants, valves, connections to existing mains and temporary water for residents. 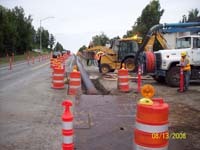 The waterline installation was in the street right of way so daily involvement with the public was part of our job- i.e., answering questions, helping pedestrians around the construction zones and traffic control. 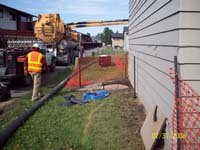 The sewer line construction on this project consisted of installing a very difficult sewage bypass system consisting of setting temporary manholes to bypass service lines from apartment buildings, dewatering and mainline replacement. 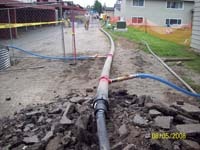 This project consisted of replacing 2,100 lf of 6-inch cast iron waterline with 10-inch HDPE pipe through the use of pipe bursting and localized excavation and connections to the existing water mains, water valves and water service connections, installation of new fire hydrants, storm drains and restoration of pavement and landscaping. 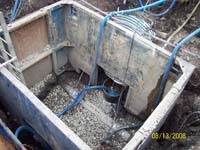 Part of this contract also consisted of the rehabilitation of approximately 776 lf of 8-inch asbestos cement sewer pipe, manhole cone replacement, dewatering and sewage bypass and all effected landscaping and pavement restoration within the utility easement. 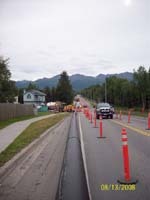 In addition to the contract, traffic calming improvements were made consisting of street improvements and pedestrian amenities and the construction of new sidewalks, storm drain, curb and gutter and landscaping.